Anyone that works with a given set of tools will know that once they get used to a certain way of working it's almost impossible to change. This applies in particular to those of you who get used to a set of short-cut keys to get things done within a given tool's IDE. Short-cut keys are a fantastic way to do things that may otherwise require multiple mouse clicks through endless windows, and they can greatly speed up development time. However what happens when you are used to a specific set of keys, but one of the tools you use doesn't work that way? Or the same keys do different things? At best it's annoying, and at worst it can lead to the loss of valuable data as you accidentally delete something by using the wrong key-combination! Which leads us to the subject of today's tech blog... GameMaker: Studio has always had short-cut keys to perform tasks within the IDE easily and quickly, and there has also always been a steady trickle of complaints and requests to change them to suit each programmers habits and toolset. However, no matter what the developers here at YoYo Games do, there will always be someone that doesn't feel comfortable with the current set of short-cuts and requires them to be changed. 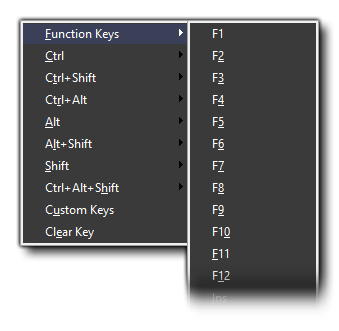 So, to make life easier and happier for everyone, the next 1.4 release of GameMaker: Studio will have a new option to permit you to bind almost any key to almost any command or anchor in the IDE. In this window you can see that there are various tabs across the top, as well as buttons to the right to scroll along to get more tabs. Each tab represents an editor in the IDE (except the General tab which is for all the main IDE short-cuts), so you can select the editor that you want to change the keys for rom here. In this way you can re-bind the keys for a large part of the IDE, including many things that don't have any keyboard short-cut assigned by default, although it should be noted that not all IDE commands can have short-cuts assigned to them, although most do permit anchors. Shortcut: The name of the command in the IDE or Editor to create a keyboard short-cut for. Key: The key (or key combination) to be assigned to the short-cut command. Anchor: The anchor letter in the IDE name for the command. This is the letter that will be underlined in the IDE, meaning that you can also use the <ALT> key plus the underlined character key to call the command. So how can we re-bind (or add) a custom set of keys for our command short-cut? Simply right-click on the key that you want to change (if it is dark grey then it can't be changed) and then select one of the multiple pre-defined bindings presented to you. Here the keys you currently have pressed will be shown, and if you hold them for three seconds then they will be bound to the selected command. In this way you customise the setup of the IDE and have it more aligned with other tools you may habitually use – this will not only be more comfortable to use, but increase your productivity. In the IDE and Editors, when you open any of the windows, and also beside many of the on-screen inputs, you will see that the command text has a character which has been underlined. This denotes that you can press <ALT> + <char> to perform that action or jump the cursor to the given input box. 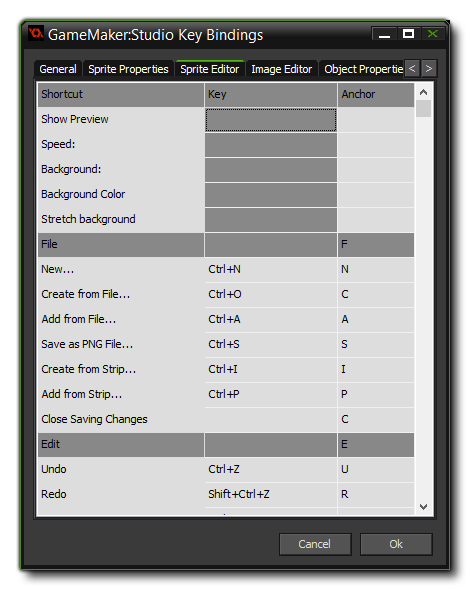 For example, if you open up the Sprite Editor you can see that the X beside the offset position box is underlined, so pressing <ALT> + <X> you can jump to that anchor directly to edit the values. To change any given anchor, you can right-click on it to get the pop-up bindings window. This pop-up shows you a list of the letters that make up the command or option name, and you can select any one of these to be the one bound to <ALT>. Hopefully this small addition to the GameMaker: Studio IDE will have a big (and positive) impact on how you use the program, streamlining your workflow and removing a few of those nasty surprises when you accidentally press the wrong keys!